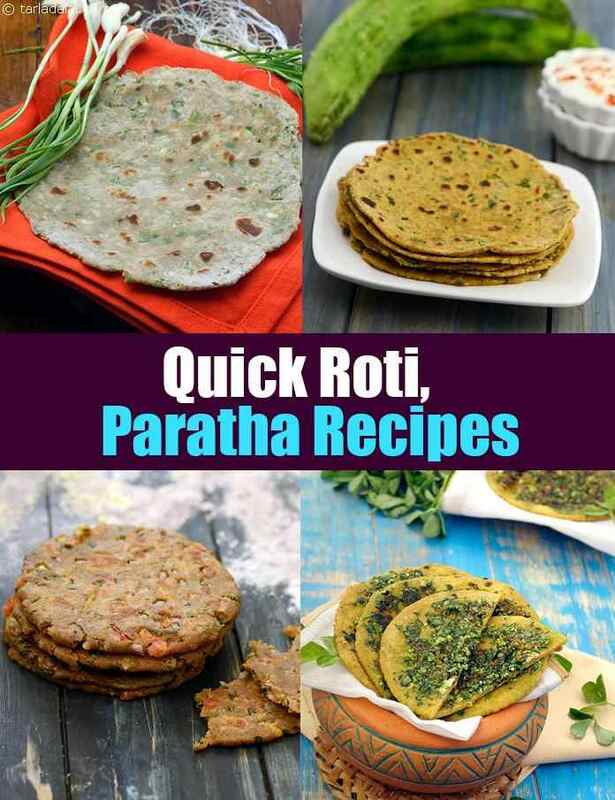 Quick Roti Recipes, 80 Quick Parathas Recipes. Most Indians cannot imagine a day without rotis /paratha. It is like how important bread is to the French people. Rotis and parathas are an integral part of a meal, especially in North India. Across the country, each community has its favourite type of flat bread and indigenous ways of making them. From, Kashmiri roti to Kerala Parota, Gujarati Padvali Roti to Bengali Mixed Sprouts Parota, try your hands on these regional favorites. While whole wheat chapatis or phulkas are an everyday fare, you can also make mouth-watering different Rotis like the Potato Paneer Rotis, Methi Makai ki Roti or Paneer and Methi Roti will give a change to the everyday meal making it more fun. Roti can be made with various flours and with an addition of an array of ingredients like leafy vegetables, cooked dals, mouth-watering veggies and spice powders added to the dough. These interesting twists make the Roti self-sufficient in taste and texture, which means they can be enjoyed as it is with no accompaniments. Parathas are more sumptuous than rotis – and usually, they are made of flour stuffed or spiced up with other ingredients like veggies, dals and spices, so you do not have to make a separate accompaniment. They can be eaten anytime of the day . You can serve scrumptious parathas like the Green Peas Paratha, with just pickles like the Instant Mango Pickle, and a cup of raita. Quick and easy parathas can even be packed in the dabba for tiffin time. When in the mood for a more earthy meal, experiment with native flours to make sumptuous treats like the Whole Wheat Bhakri, which are to be enjoyed right off the tava, with jaggery and ghee. Aloo Paratha and the Gobi Paratha are traditional breakfast dishes in the Northern region. Also, you can perk up the health quotient by using wholesome flours like jowar flour, oats, ragi flour or other nutritious multi-grain flours to make parathas and roti.Give kids anything made with chocolate and cheese and they will happily eat it. These unique Chocolate Cheese Paratha, Broccoli and Cheese Parathas, Cheese Paratha will surely bring back happy faces and empty dabbas from school. Enjoy our Quick Roti Recipes, 80 Quick Parathas Recipes and other quick recipe articles below. Who said rotis are boring? try this exciting combination of paneer, potatoes, coriander and green chillies and be prepared to be amazed! Potatoes themselves are a great value-add for any roti or subzi, and much loved by kids and adults alike. Add to this the goodness of fresh spinach, creamy yoghurt and energizing wheat flour, and there you have on the table a power-packed meal! Popeye would've loved this one ! Paper-thin phulkas served hot off the tava, smeared with ghee, these rotlis feel special, even if you have them everyday! rotlis are generally made just before the meal is to be served, but if you make them in advance, then wrap them in a cloth so that they remain hot and soft.